Finely chop eschallots, garlic, chilli and coriander roots and stems. Place in a pot with olive oil and cook on low –medium until translucent and fragrant. Add passionfruit (seeds and pulp), sugar and vinegar and simmer for about 5 minutes, until the sauce thickens. Remove from heat and season to taste. Cut the pork into 3cm thick steaks, across the grain. 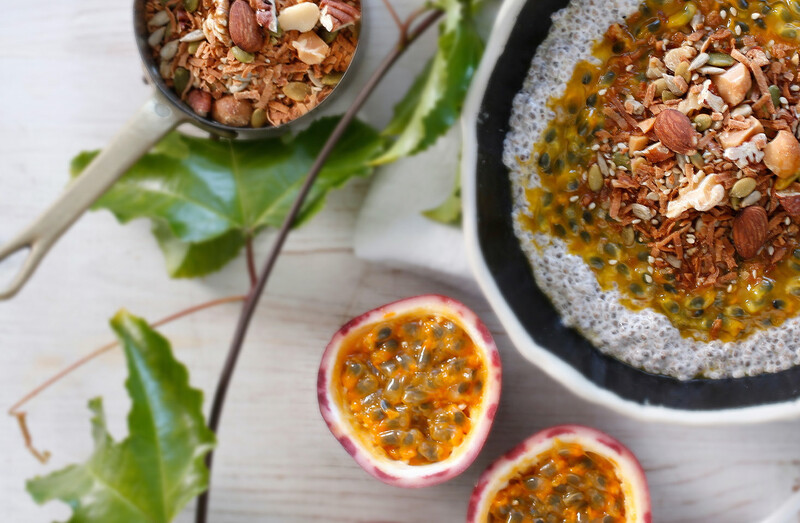 Remove pulp from for passionfruit and place in a bowl. Microwave for 1 minute, then pass through a sieve to extract the juice (discard seeds). Marinate the pork in the passionfruit juice overnight. Preheat oven to 160oC. Heat a large heavy-based ovenproof saucepan to high with some olive oil. Remove pork from the marinade, then fry in batches until well caramelized on both sides. Set meat aside and deglaze the pan with vegetable stock and stir in tomato paste, oregano and any reserved passionfruit marinade. Return pork to pot and cover with baking paper. Cover with a tight-fitting lid and bake in oven for four or five hours, or until the meat is falling apart. Once the pork has cooled slightly, it is ready to be pulled. You can do this by using two forks, but it’s quicker by hand. Put on a pair of dishwashing gloves to protect your hands from the heat, and gently use your fingers to shred the meat. Place back in the pot together with any cooking liquid, then place back on the stove and cook until the sauce has thickened (if needed). Season to taste. To serve, toast the buns and place a generous amount for pulled pork inside. 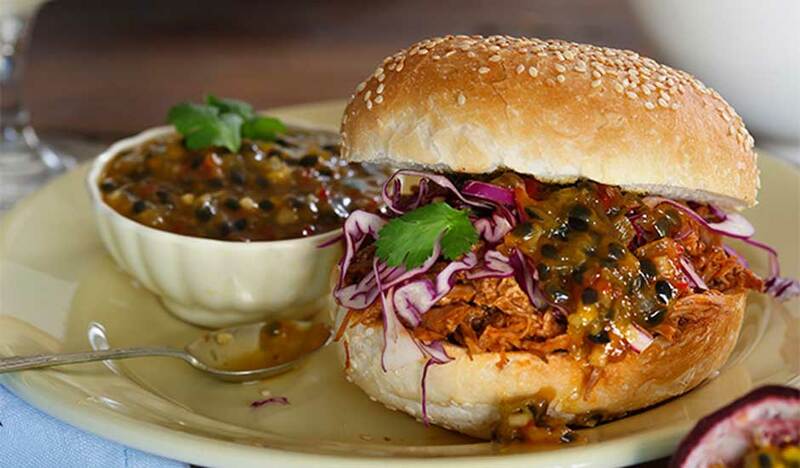 Top with shredded red cabbage and coriander leaves than a dollop of relish. Serve immediately. Sammy & Bella Jakubiak, winners of My Kitchen Rules 2011 and now ambassadors for Australian Passionfruit.